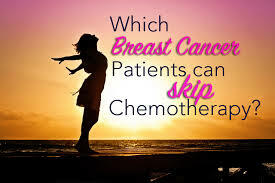 The philosophy of chemotherapy has evolved to the present time in which many fewer breast cancer patients are being offered chemotherapy. Just as the tenets of chemo have changed, researchers have discovered that cancer stem cells propel recurrences. As will be shown in this CHEMOTHERAPY section, chemo may fail because chemotherapy helps promote cancer stem cells, and even a "stemness" in cancer cells that are not stem cells, that all lead to chemo resistance. The Hou ZJ et al. 2015 study suggests that an anti-parasite drug can target these cancer stem-like cells. How about considering an anti-parasite herb, instead? PLEASE READ THIS SECTION FOR MORE INFORMATION. CAN HAVING A BRCA1 OR BRCA2 MUTATION INCREASE CHEMO TOXICITY? BRCA 1 and BRCA2 are "proteins central to the DNA repair process". So, what happens if a breast cancer patient has a mutated BRCA 1 or BRCA 2 protein and is given genotoxic chemo? Results: "Febrile neutropenia had an incidence of 35% ,14%, and 10% among BRCA1, BRCA2 and non-carriers, respectively. Grade 4 neutropenia was found in 57% of BRCA1, 14% of BRCA2 , and 18% of non-carriers. G-CSF (granulocyte-stimulating factor) support was necessary in 86% of BRCA1 , 64% of BRCA2 , and 51% of non-carriers." CONCLUSION: "BRCA 1 germline mutations are associated with greater acute hematological toxicity in breast cancer patients." The researchers stated that these observations could have "implications" for some kind of treatment to reduce the toxicity of chemo. GOOD NEWS FOR EARLY BREAST CANCER! "Use of the Oncotype DX test, which analyzes genes involved in tumor recurrence, has cut the use of chemotherapy in U.S. breast cancer patients by 20 percent over the past eight years, according to its maker, Genomic Health Inc "
Intermediate risk of breast cancer recurrence? EARLY BREAST CANCER? INTERMEDIATE RISK? SAFELY SKIP CHEMO! HAVE AN INTERMEDIATE RISK OF BREAST CANCER RECURRENCE ON THE 21 -GENE ASSAY? SPECIFICALLY, A SCORE BETWEEN 11 AND 25? HAVE EARLY STAGE BREAST CANCER? NO POSITIVE LYMPH NODES, NOT HER2 POSITIVE, AND HORMONE RECEPTOR- POSITIVE? We already know that for early breast cancer (no positive lymph nodes, not HER2 positive, and hormone- positive), that with a score of 10 or under (scoring from 0 to 100) on the 21- gene test, chemo is not needed. (See the 2015 study cited below.) For a score of 25 or more, chemo is suggested. But what about a mid-range score between 11 and 25 - an intermediate risk of breast cancer recurrence? in a prospective study of 6711 early stage breast cancer patients with scores between 11 and 25, the patients either took chemo followed by hormone therapy or just hormone therapy. Results: "The 9-year rate of distant recurrence in women with a recurrence score of 11 to 25 in our trial was approximately 5%, irrespective of chemotherapy use ..."
Discussion: "The results of our trial suggest that the 21-gene assay may identify up to 85% of women with early breast cancer who can be spared adjuvant chemotherapy, especially those who are older than 50 years of age and have a recurrence score of 25 or lower, as well as women 50 years of age or younger with a recurrence score of 15 or lower..."
EARLY BREAST CANCER? LOW RISK ? SAFELY SKIP CHEMO! A LOW RISK OF RECURRENCE? A SCORE OF 10 OR LOWER ON THE 21-GENE ASSAY? The Sparano J et al. 2015 prospective study, employing the Oncotype DX 21 genes assay, found that early stage breast cancer patients can safely avoid the rigors of chemo. The study enrolled 10,253 breast cancer patients who were stratified into low risk, medium risk, or high risk for recurrence, via the multigene Oncotype DX test. Of the 10,263 patients, 15.9% scored low, with a multigene test score of 10 or lower. These patients were offered only the hormone therapy, tamoxifen. NO CHEMO. ""This should provide a lot of reassurance to women and their physicians," co-author, Dr. Kathy Albain, said. "In women whose breast cancer scored low on the multigene test, there was outstanding survival with endocrine therapy alone. The test provides us with greater certainty of who can safely avoid chemotherapy." https://www.sciencedaily.com/releases/2015/09/150928092550.htm. For the study, Sparano J et al., Prospective Validation of a 21-Gene Expression Assay in Breast Cancer. New England Journal of Medicine. 2015. MORE INFORMATION BELOW IN THIS SECTION. ​ "Chemotherapy (chemo) is treatment with cancer-killing drugs that may be given intravenously (injected into a vein) or by mouth. The drugs travel through the bloodstream to reach cancer cells in most parts of the body. Chemo is given in cycles, with each period of treatment followed by a recovery period. Treatment usually lasts for several months"
Adjuvant Chemo: "When therapy is given to patients with no evidence of cancer after surgery, it is called adjuvant therapy. Surgery is used to remove all of the cancer that can be seen, but adjuvant therapy is used to kill any cancer cells that may have been left behind or spread but can't be seen even on imaging tests. Neoadjuvant Chemo: "... You get the treatments (or at least start them) before or after surgery ...First, chemo may shrink the tumor so that it can be removed with less extensive surgery....Also, by giving chemo before the tumor is removed, doctors can better see how the cancer responds." one of the taxanes. Pertuzumab (Perjeta) can also be combined with trastuzumab and docetaxel for HER2 positive cancers." ​ * DON'T HAVE EARLY STAGE BREAST CANCER? COGNITIVE IMPAIRMENT EVEN BEFORE CHEMO? ​ Do freaking out breast cancer patients - PRIOR TO CHEMOTHERAPY - have cognition problems? In the Cimprich B et al. 2010 study, researchers employed functional MRI brain scanning on these breast cancer patients while performing a working memory task. Lead researcher, Bernadine Cimprich, PHD, RN, commented, "Our initial findings showed that the level of worry interfered with patients' ability to do a task. The level of worry had a key role in the cognitive problems with women before treatment, and the worry was related to fatigue." In the Jung MS et al. 2016 study, the researchers concluded, "Pre-chemotherapy interventions should target both neurocognitive deficits and symptom burden to improve cognitive outcomes for breast cancer patients." In the 2010 Cimprich B et al. study, the researchers conducted MRI studies on breast cancer patients with localized breast cancer BEFORE chemotherapy to test their "selective attention and working memory". Results: "Compared with healthy controls, patients showed (a) bilateral brain activation in high-damaged task conditions with recruitment of additional components of attention/working memory circuitry, and (b) less accurate and slower task performance." Conclusion: "Results indicate compromised cognitive function before any chemotherapy and raises key questions for further research,"
EDITORS' NOTE:: This is one of the Editors' favorite studies, as it shows that breast cancer patients already have some neurological damage even prior to undergoing chemo. One wonders why. The stress of the diagnosis? The disease process? "At the 35th Annual San Antonio Breast Cancer Symposium (2012), Bernadine Cimprich, PhD, RN, presented data suggesting that pretreatment neurocognitive compromise and fatigue contribute to cognitive issues formerly associated solely with chemotherapy. ... Dr. Cimprich explained the design of the trial. 'Functional magnetic resonance imaging was used to directly test brain function while a woman was performing a working memory task in the scanner before adjuvant treatment and then 1 month after adjuvant treatment.' After each scan, patients self-reported on levels of cognitive functioning and fatigue. In both patient groups, pretreatment brain imaging revealed lower functioning versus the control arm in frontal regions of the brain that were necessary to the performance of the working memory task. The cognitive impairment was most severe in women awaiting chemotherapy. 'The chemotherapy group actually had the lowest level of activation [before treatment].' Additionally, lower functioning in this area of the brain before treatment predicted the severity of fatigue, and greater fatigue was linked with greater cognitive impairment over time. Dr.Cimprich said the study demonstrates the need for increased awareness of the vulnerability of women awaiting chemotherapy to cognitive problems related to worry and fatigue." ​In the 2015 Babacan T et al. study, the researchers conducted a retrospective study on the "records of patients with long-term follow-up at their center between 2013 and 2014" to evaluate the benefits of chemotherapy. Excluding T4 disease, the researchers "compared two groups of patients: those given both chemotherapy (doxorubicin+cyclophosphamide) and hormonotherapy, and those prescribed hormonotherapy alone. The primary endpoints were progression-free and overall survival." Results: "No differences were observed between these two treatment groups in either progression free survival or overall survival. However, for both outcomes, there was a trend towards improved progression free survival and overall survival favoring the hormone-only group." Conclusion: "In selected subgroups of breast cancer patients, administering adjuvant hormonal therapy alone seems to be at least as good if not better than combining hormonotherapy and chemotherapy." HOW DO YOU KNOW WHAT CHEMO TO TAKE?​ - DOCTORS UNDER REPORT CHEMO SYMPTOMS IN PATIENTS - SEVERE SYMPTOMS UNDER REPORTED 13% to 50% - LAMENTABLE FOR CANCER PATIENT CHOICE. "Subjective toxicities are at high risk of under-reporting by physicians, even when prospectively collected within randomized trials. This strongly supports the incorporation of patient-reported outcomes into toxicity reporting in clinical trials." The toxic effects of chemo make every cancer patient wary of undergoing chemotherapy treatment. chemo side effects to guide them before embarking upon chemotherapy. "Given the potential for under-reporting (of chemo toxicities), our aim was to compare reporting by patients and physicians of six toxicities (anorexia, nausea, vomiting, constipation, diarrhea, and hair loss) within three randomized trials." The results of these three clinical trials revealed that there was an under-reporting of chemo toxicities experienced by the cancer patients and reported to their doctors. Findings: "For patients who reported toxicity (any severity), under-reporting by physicians ranged from 40.7% to 74.4%." "Examining only patients who reported 'very much' toxicity, under-reporting by physicians ranged from 13.0% to 50.0%." Conclusion: "Subjective toxicities are at high risk of under-reporting by physicians, even when prospectively collected within randomized trials. This strongly supports the incorporation of patient-reported outcomes into toxicity reporting in clinical trials." "It would be useful for all doctors in active practice perhaps to rethink the principal ethical mandate of all physicians since the time of Hippocrates– 'nil nocere' – do no harm. The evidence is overwhelming now that chemotherapy only does harm. Would the oncologists promoting chemo to their patients ever take the same were the roles reversed?" ​F. WIlliam Engdahl, Why Didn't My Doctor Tell Me Chemo Kills?, Society, March 6, 2015. "The introduction of cytotoxic chemotherapy for solid tumors and the establishment of the sub-speciality oncology have been accepted as an advance in cancer management. However, despite the early claims of chemotherapy as the panacea for curing all cancers, the impact of cytotoxic chemotherapy is limited to small subgroups of patients and mostly occurs in the less common malignancies." ​Morgan G et al., 2004. ​ In the Morgan G et al. 2004 study, the Australian researchers "undertook a literature search for randomized clinical trials reporting a 5-year survival benefit attributable solely to cytotoxic chemotherapy in adult malignancies". The researchers reviewed records for the total number of newly diagnosed cancer patients for 22 malignanies in both Australia and the US for the year 1998. "For each malignancy, the absolute number to benefit was the product of (a) the total number of persons with that malignancy; (b) the proportion or subgroup(s) of that malignancy showing a benefit; and (c) the percentage increase in 5-year survival due solely to cytotoxic chemotherapy. The overall contribution was the sum total of the absolute numbers showing a 5-year survival benefit expressed as a percentage of the total number for the 22 malignancies." Results: "The overall contribution of curative and adjuvant cytotoxic chemotherapy to 5-year survival in adults was estimated to be 2.3% in Australia and 2.1% in the USA." Conclusion: "As the 5-year relative survival rate for cancer in Australia is now over 60%, it is clear that cytotoxic chemotherapy only makes a minor contribution to cancer survival. To justify the continued funding and availability of drugs used in cytotoxic chemotherapy, a rigorous evaluation of the cost-effectiveness and impact on quality of life is urgently required." Tumors are examined for gene expressions that predict chemo success. How about examining CELL CYCLE gene expression to predict chemo success? In the Hallet R et al. 2015 study, " ... Changes in gene expression occurring during response to chemotherapy are also related to patient response. .... For example, basal-like (triple negative) breast tumors harbor the highest frequency of mutations in TP53 (tumor suppressor gene), and patients with basal-like tumors are known to experience the highest rates of pathological response." In the 2015 Hallett R et al. study, the researchers discovered chemo treatment-induced "transcripts to identify biological processes that change in response to treatment as these might represent biomarkers that predict therapy response and may reveal mechanisms of treatment resistance." The researchers found that genes were differently expressed before and after chemo treatment in breast cancer patients. After chemo treatment, there was "either increased or decreased cell cycle gene expression." Import? An increase in cell cycle gene expression bodes well for the chemo treatment. A decrease in cell cycle gene expression means there is resistance to the chemo. The researchers developed a "gene expression signature" that could predict a breast cancer patient's response to chemo. Findings: "Investigations in tumor cell lines supported these (cell cycle gene expression) findings (in the breast cancer patients), and linked treatment induced cell cycle changes with p53 (tumor suppressor gene) signaling and G1/G0 arrest. Specifically, in a subset of breast cancer tumor cell lines, the cells entered G1/G0 cell cycle arrest following the administration of the chemo drug. Further experimenting "linked this behavior with TP53 integrity; activation of p63 signaling was sufficient to induce G1/G0 arrest, which in turn protected cells from further chemotherapy treatments, thus permitting subsequent tumor cell regrowth post-therapy". "Hence, chemotherapy resistance, which can be predicted based on dynamics in cell cycle gene expression, is associated with TP53 integrity." Here, the researchers advocate modulating p53 signaling to help the effectiveness of the chemo. WHY CHEMO MAY FAIL - CHEMO, CANCER STEM CELLS, AND CHEMO RESISTANCE - WHAT ARE CANCER STEM CELLS? "Research has shown that cancer cells are not all the same. Within a malignant tumor, ... there can be a variety of types of cells. The stem cell theory of cancer proposes that among all cancerous cells, a few act as stem cells that reproduce themselves and sustain the cancer, much like normal stem cells normally renew and sustain our organs and tissues. In this view, cancer cells that are not stem cells can cause problems, but they cannot sustain an attack on our bodies over the long term." "In a study with mice, University of Michigan scientists identified a receptor molecule on the surface of breast cancer stem cells... It triggered abnormal cell growth in response to tissue inflammation and damage caused by chemotherapy. When this receptor was blocked, the breast cancer stem cells died, preventing the cancer from spreading." "Chemotherapy is a critical component in the therapeutic landscape for nearly every category of cancer. Unfortunately, although chemotherapy frequently succeeds in reducing tumor burden, the efficacy of many agents is limited by acquired resistance. .... The last several years have ushered a substantial and growing body of evidence that cancer stem cells contribute to this phenomenon (chemo resistance)." "Our study showed that chemotherapy turns on HIF (promotes hypoxia - low oxygen), and that HIF enhances the survival of breast cancer stem cells. Cancer stem cells, are the cancer cells that must be killed to prevent relapse and metastasis. The good news is that we have drugs that block HIF from acting." ​Triple negative breast cancer is defined as a non-hormone sensitive breast cancer with heightened breast cancer stem cells that is considered to be a more aggressive breast cancer. When triple negative breast cancer patients are treated with chemotherapy, such as paclitaxel or gemcitabine, there is generally only a favorable response rate of less than 20%. Eradication of breast cancer stem cells is necessary to defeat cancer, but chemo treatments enrich the population of cancer stem cells, thereby increasing the survival, the self-renewal of these cancer cells. In the 2014 Samanta D et al. study, the researchers experimented with three different triple negative breast cancer cell lines with paclitaxel or gemitabine and found that the chemo after four days increases ROS levels, generating HIFs (hypoxia inducing factors), "leading to the HIF-dependent expression of MRDI (multi-drug resistant protein that expels drugs), IL-8 and/or IL-6, and to breast cancer stem cell enrichment." It is already known that IL-6 (pro-inflammatory) and IL-8 (promotes angiogenesis) increase tumor growth and decrease survival in triple negative breast cancer cells. And now it has been discovered that IL-6 and IL-8 have been "implicated" in maintaining breast cancer stem cells, helping to explain why chemo hasn't been able to successfully kill cancer cells via apoptosis, and is failing. in triple negative breast cancer. And, of course, the increase in MDRI has resulted in chemo being expelled from cancer cells. The researchers decided to try giving an HIF inhibitor, digoxin, along with the chemo. From the Johns Hopkins Press Release: " ... When triple-negative breast cancer cells were given paclitaxel plus the HIF inhibitor, digoxin, MDR1 levels went down rather than up." This means that the chemo was no longer being expelled from the tumor cells. "In mice that were implanted with triple-negative breast cancer cells, treatment with digoxin and paclitaxel decreased tumor size by 30 percent more than treatment with paclitaxel alone. The combination therapy also decreased the number of breast cancer stem cells and the levels of MDR1. Treatment with digoxin plus a different chemotherapy drug, gemcitabine, brought tumor volumes to zero within three weeks and prevented the immediate relapse at the end of treatment that was seen in mice treated with gemcitabine alone." Conclusion: "Cytotoxic chemotherapy induces ROS-dependent expression of HIF-1α and HIF-2α, leading to HIF-mediated expression of IL-6, IL-8, and MDR1, which promote the survival of breast cancer stem cells, a response that is a critical determinant of treatment failure." Enter HIF inhibitors. "Giving HIF inhibitors together with traditional chemotherapy decreased tumor size in mice." " 'Our study showed that chemotherapy turns on HIF and that HIF enhances the survival of breast cancer stem cells, which are the cancer cells that must be killed to prevent relapse and metastasis,' says Dr. Gregg Semenza, the C. Michael Armstrong Professor of Medicine at Johns Hopkins and a Johns Hopkins Kimmel Cancer Center expert. 'The good news is that we have drugs that block HIF from acting.' "
​(For the study, see Samanta D et al., Hypoxia-Inducible Factors are Required for Chemotherapy Resistance of Breast Cancer Stem Cells, PNAS, 2014. .... For the Johns Hopkins Press Release, see http://www.hopkinsmedicine.org/news/media/releases/toughest_breast_cancer_may_have_met_its_match. (defined by low expression of classical biomarkers such as CD44) were found to transiently-transition to a CD44 drug resistant phenotype with a putative capacity to re-initiate tumor development following cessation of treatment (chemo)." ​Chemo can't kill every tumor cell, and can leave behind some tumor cells and a population of cancer stem cells. It is these cancer stem cells that ominously spur regrowth. We just learned, above, that chemo treatment enhances the survival of the cancer stem cell population in cancer stem cell enriched- triple negative breast cancer cells. No worries if a tumor cell does not harbor cancer stem cells? In their 2015 study, Goldman A et al. surprisingly found that treatment with the common chemo drug, docetaxel (a taxane), in breast cancer cells that did not have any markings for cancer stem cells, could take on "markers of stemness" and chemo resistance. After taxane treatment, the cells began to physically appear to be like cancer stem cells, which included "receptors on the cell surface to which specific proteins can bind", which all suggested that these cells were "transitioning into a different state". And, "This state is associated with a clustering of ​CD44 and ​CD24 in membrane lipid rafts, leading to the activation of Src (promotes tumor invasion)Family Kinase (SFK)/​hemopoietic cell kinase ​(Hck) and suppression of apoptosis." Testing two inhibitors, which resulted in a large fraction of the tumor cells being killed, the researchers proceeded to test the chemo and inhibitors in a mouse model of breast cancer. Results? " ...Treatment with dasatinib (an inhibitor of the Src family) just a few days after administering two high doses of chemotherapy prevented tumor growth and increased survival rates (in the mice). Treating cells simultaneously with docetaxal and dasatinib or administering dasatinib after a longer period of time did not produce the same effects." Conclusion: "Despite the pervading dogma, we found something quite surprising: non-cancer stem cells (defined by low expression of classical biomarkers such as CD44) were found to transiently-transition to a CD44 drug resistant phenotype with a putative capacity to re-initiate tumor development following cessation of treatment." Thus, "The researchers theorize that the cancer cells go through a temporary transition state, which means that administering the drugs in a very specific time frame and sequence is important." CHEMO TO SUPPRESS BREAST CANCER STEM-LIKE CELLS? ​In the Hou ZJ et al. 2015 study, the researchers stated, "Cancer stem cells are considered to be resistant to chemotherapy due to their expressing drug pumps. ...Similarly, cancer stem-like cells could acquire drug transporters rendering cells' chemoresistance." An anti-parasite drug suppresses stem cell-related genes, like c-myc. Dr. Clark found Fasciolopsis buski harbors c-myc. The authors suggest an anti-parasite drug. Why not consider using an anti-parasite herb? Yes! .... So suggests a 2015 study! In the Hou ZJ et al. study, the researchers note, "Chemoresistance is a major obstacle to successful treatment of cancer. Cancer stem cells are considered to be resistant to chemotherapy due to their expressing drug pumps ... Similarly, cancer stem-like cells could acquire drug transporters rendering cells chemoresistance." Cancer stem-like cells are believed to be a "distinguished sub-group of proliferating cells concomitant with activating self-renewal capability." And these cancer stem-like cells are "enhanced by chemotherapy and radiation". How to overcome chemoresistance and these stem-like cells? Here are some of the ways that this drug may be helpful: "(1) Flubendazole inhibited breast cancer cell proliferation in vitro and suppressed tumor growth in vivo; (2) flubendazole reduced breast cancer stem-like cells evidenced by loss of CD44high/CD24low population, reduction of mammospheres and the suppressed expression of stem cell related genes (c-myc, oct4, sox2, nanog and cyclinD1); (3) flubendazole induced cell differentiation, decreased cell migration and overcame drug resistance in breast cancer cells; (4) mechanistically, flubendazole induced monopolar spindle formation by inhibiting tubulin polymerization followed by cell cycle blockage at G2/M phase in breast cancer cells." Conclusion: "These new data suggested the potential utilization of flubendazole in breast cancer treatment by targeting cancer stem-like cells." Angiogenesis inhibitors block the growth of new blood vessels. Any clues as to why the angiogenesis inhibitor, Avastin, was revoked for breast cancer? In the Conley S et al. 2012 study, the researchers, knowing of cancer stem cells' metastatic potential, "hypothesized that hypoxia induced by administration of antiangiogenic agents might accelerate tumor growth and metastasis by increasing the cancer stem cell population." While the drug, Avastin, was withdrawn for breast cancer due to limited usefulness, using breast cancer cell culture studies and studies in mice, the Conley S et al study, "further suggests that antiangiogenic agents actually increase the invasive and metastatic properties of breast cancer cells". First, "In vitro studies revealed that hypoxia-driven stem/progenitor cell enrichment is primarily mediated by HIF1a (hypoxia-inducible factor 1a. We further show that the Akt/B-catenin cancer stem cell ergulating pathway is activated in breast cancer cells under hypoxic conditions in vitro and in sunitnib (anti-angiogeneis drug)-treated mouse xenografts." Secondly, there were in vivo studies of mice with breast cancer xenografts that were treated with antiangiogenic drugs, sutitnib and bevacizumab (Avastin).The findings were that the drug-treated mice had "extensive areas of hypoxia in tumors" as opposed to the untreated mice. Also, "Concomitantly with the increase in hypoxia, the percentage of cancer stem cells within these tumors also increased." In addition, the researchers found, "Interestingly, pretreatment of the mice with sunitnib before tumor inoculation was shown to increase metastasis of breast cancer cells, suggesting that this observed effect may result from a 'host' response to the drug. Indeed, manipulation of the tumor microenvironment likely induces a range of responses, in both the tumor as well as the host." Conclusion: "We propose that an increase in the (hypoxia-driven stimulation of) cancer stem cell population would contribute to the overall aggressiveness of a tumor. Our findings that treatment with the antiangiogenic agents sunitnib or bevacizumb leads to an increase in cancer stem cells provides a potential explanation for the limited clinical effectiveness of antiangiogenic agents." ​FROM THE ARTICLE, WHY DIDN'T MY DOCTOR TELL ME CHEMO KILLS? It gets worse. Because of the chemo resulting in immune system suppression, patients often get typhlitis, a life-threatening gastrointestinal complication of chemotherapy. Typhlitis is an intestinal infection which may manifest itself through symptoms including nausea, vomiting, diarrhea, a distended abdomen, fever, chills, or abdominal pain and tenderness. Typhlitis is a medical emergency. It has a very poor prognosis and is often fatal. It can cause infertility failure in men and ovarian failure in women. All that in addition to the well-known hair-loss, dry skin, damaged fingernails, a dry mouth (xerostomia), water retention, and sexual impotence." STAGE BREAST CANCER PATIENTS AT RISK FOR HOSPITALIZATION? In the Barcenas C et al. 2014 study, the researchers sought to determine a breast cancer patient's risk for hospitalization during chemo treatment for early breast cancer. The breast cancer patients, of varying age groups, were categorized according to whether they received "docetaxel and cyclophosphamide..... doxorubicin and cyclophosphamide .... docetaxel, cyclophosphamide, and docorubicin ... doxorubicin and cyclophosphamide plus docetaxel .... dose-dense doxorubicin and cyclophosphamide + paclitaxel .... or doxorubicin and cyclophosphamide + weekly paclitaxel. We compared the rates of chemotherapy-related hospitalizations that occurred within 6 months of chemotherapy initiation." docetaxel- doxorubicin -cyclophosphamide .... and doxorubicin and cyclophosphamide and docetaxel "had significantly higher rates of hospitalization than did patients having docetaxel and cyclophosphamide". *"Among patients older than age 65 years, these rates ranged from 12.7% (docetaxel and cyclophosphamide) to 24.2% (docetaxel- doxorubicin -cyclophosphamide)." *"The rates of hospitalization of patients who received docetaxel- doxorubicin -cyclophosphamide .... doxorubicin and cyclophosphamide + docetaxel .... doxorubicin and cyclophosphamide ...., or doxorubicin and cyclophosphamide + weekly paclitaxel were higher than those of patients who received docetaxel and cyclophosphamide." Conclusion: "Docetaxel- doxorubicin -cyclophosphamide ..... and doxorubicin and cyclophosphamide + docetaxel were associated with the highest risk of hospitalization in patients younger than age 65 years. Among patients older than age 65 years, all regimens (aside from dose-dense doxorubiicin and cyclophosphamide + paclitaxel) were associated with a higher risk of hospitalization than docetaxel and cyclophosphamide." ​CHEMO SIDE EFFECTS - DOES BRAIN STRUCTURE ACTUALLY CHANGE AFTER CHEMO? BRAIN STRUCTURE CHANGE AFTER CHEMO WITH PARTIAL RECOVERY? "In summary, the present study (Lepage -2014) demonstrated grey matter volume loss in diffuse brain regions in breast cancer patients one month following chemotherapy treatment. One year following treatment, grey matter was partially recovered. Grey matter volumes were related to cognitive performance in the domains of processing speed, working memory, and visual memory. ​ Cognitive dysfunction was found to follow a similar course to grey matter changes, particularly in the domain of processing speed. " A horrified yes .... with partial recovery. In the Lepage C et al. 2014 study, the researchers' "aim was to extend the cancer-cognition literature by investigating the association between grey matter attenuation and objectively measured cognitive functioning in chemotherapy-treated breast cancer patients." So, does the brain structure actually change after chemo? After surgery, breast cancer patients had MRI testing prior to taking chemo. Then, one month following chemo treatment, and one year after the completion of the treatment the patients had MRIs. Results: "One month following chemotherapy, patients had distributed grey matter volume reductions. One year after treatment, a partial recovery was observed with alterations persisting predominantly in frontal and temporal regions. This course was not observed in the healthy comparison group. Processing speed followed a similar trajectory within the patient group, with poorest scores obtained one month following treatment and some improvement evident one year post-treatment." Conclusion: " ...The present study demonstrated grey matter volume loss in diffuse brain regions in breast patients one month following chemotherapy treatment. One year following treatment, grey matter was partially recovered. Grey matter volumes were related to cognitive performance in the domains of processing speed, working memory, and visual memory. Cognitive dysfunction was found to follow a similar course to grey matter changes, particularly in the domain of processing speed. This study strengthens the evidence for the relationship between brain alterations and objectively measured cognitive difficulties in breast cancer patients exposed to chemotherapy. In addition to the burden of being diagnosed with a life-threatening disease, breast cancer patients must contend with potential adverse side effects of treatment"
​ SUMMARY OF KAM J ET AL., 2015 STUDY​ BY MANGILA SANKAR, 2015. A large part of the ​ brains were turned off when the participating breast cancer patients thought they were focusing on a task. When not performing as task or told to relax, the brains of breast cancer survivors were found to be more active than those of healthy women." 'A healthy brain spends some time wandering and some time engaged.' He added, 'We found that chemo brain is a chronically wandering brain. They’re essentially stuck in a shut out mode.' "
In the 2015 Kam J et al. study, the researchers "examined whether breast cancer survivors who self-reported cognitive problems up to 3 years following cancer treatment performed differently from healthy controls in a task that required sustained attention." For the study, "Participants performed a target detection task while periodically being asked to report their attentional state. Electroencephalogram (which detects brain activity) was recorded during this task and at rest." Results: The breast cancer patients were less likely to maintain their state of attention to a task as opposed to healthy people. What is really compelling is the objective testing conducted of the P3 wave. The P3 wave is generated during the decision-making process. In this case, "...The P3 event-related potential component elicited by visual targets during the task was smaller in the breast cancer survivors than in the healthy controls. The breast cancer survivors also displayed greater neural activity at rest." Conclusion: "Breast cancer survivors demonstrated an abnormal pattern of sustained attention and resource allocation compared to healthy controls, suggesting that attentional deficits can be objectively observed in breast cancer survivors who self-report concentration problems." In accord with the Kam J et al. study is the Piccirillo JF et al. 2015 study. In this second study, the researchers "hypothesized that cognitive impairment may result from dysfunction in large-scale brain networks, particularly those involved in attentional control." For this study, breast cancer patients with invasive ductal or lobular triple-negative breast cancer who had completed their chemo within two years of the study and either did have or did not report cognitive difficulties (the controls) were chosen to participate. Findings: "Women who self-reported cognitive impairment were found to have disrupted resting-state functional connectivity, as measured by MRI, when compared to women who did not self-report cognitive impairment. These findings suggest that some women may be more sensitive to the standard treatments for breast cancer and that this increased sensitivity may result in functional connectivity alterations in the brain networks supporting attention and executive function." Conclusion: "Neuroimaging analyses confirmed self-reported cognitive deficits in women with breast cancer treated with chemotherapy." "Microsporidia species are obligate intracellular parasites and constitute one of the most important opportunistic pathogens that can cause severe infections especially in immunocompromised patients." In the 2015 Hamamci B et al. study, the researchers investigated the microsporidia, Enterocytozoon bieneusi and Encephalitozoon intestinalis, in patients undergoing chemotherapy. A total of 123 stool samples were taken from 93 patients undergoing chemo, of whom fifty-one (55%) of the patients had diarrhea. The presence of E.intestinalis and E.bieneusi was found in "a total of 65 (69.9%) patients, including 43 (46.2%) E.intestinalis, 9 (9.7%) E.bieneusi and 13 (14%) mixed infections". By contrast, in the 30 healthy people, "5 (16.7%) were positive, including 2 (6.7%) E.intestinalis, 1 (3.3%) E.bieneusi and 2 (6.7%) mixed infections". Conclusion: "As a conclusion, the prevalence of E. intestinalis and E. bieneusi in cancer patients under chemotherapy was detected quite high (69,9%) in our study. It would be approperiate to screen these patients regularly in terms of microsporidian pathogens." 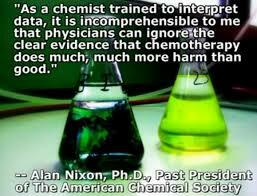 "Chemotherapy kills more than cancer. Want proof? Did you know that 9 out of 10 oncologists would refuse chemotherapy if they had cancer? That's up to 91% -- a huge percentage that clearly shines a light on the truth: chemotherapy kills. Conventional oncologists are not only allowing this to happen, but they're also bullying many patients into chemotherapy and surgery right after their diagnoses."